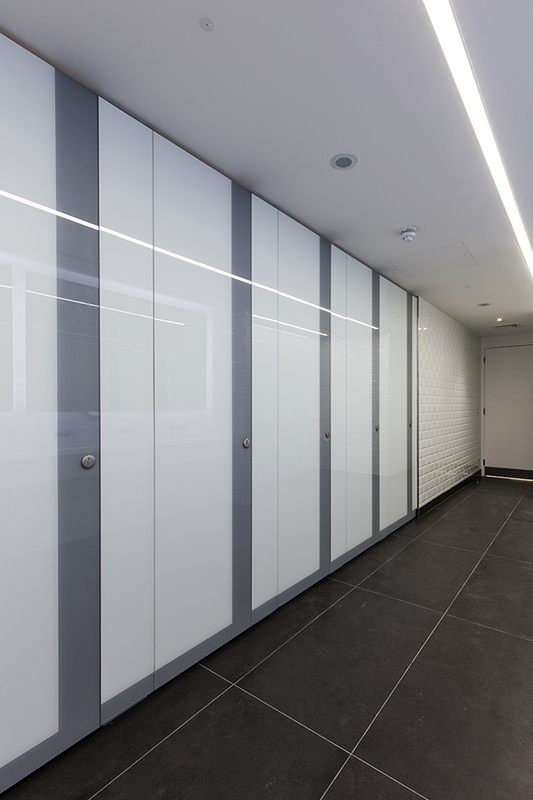 We’ve designed and installed a sleek new staff shower area and co-ordinating washrooms for a London office. Forza solid grade laminate Z style lockers. 55 Bishopsgate is ideally located in the heart of the City of London and comprises 198,000 sq. ft. of office and retail accommodation. The building has recently been refurbished throughout to a high standard and is currently multi-let to eight tenants. As part of the extensive refurbishment project we were called on to create staff shower facilities to cater for increasing numbers of office staff who walk or cycle into work on a regular basis. The new shower and changing area features our highly engineered Marcato cubicles manufactured from 20mm solid grade laminate in grey with white pilasters to create an attractive striped effect finish. 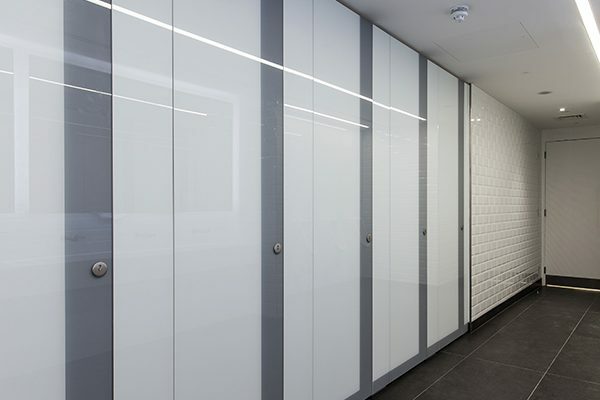 The cubicles were manufactured floor to ceiling with minimal floor clearance and feature rebated edges to create a flush front design and ensure division panels and doors meet edge to edge for maximum privacy. In order to maximise space each cubicle was designed to include a shower enclosure with hinged glass door and raised shower tray as well as a bespoke bench. The result is a high quality shower area offering complete privacy and plenty of space for office staff to shower and change. 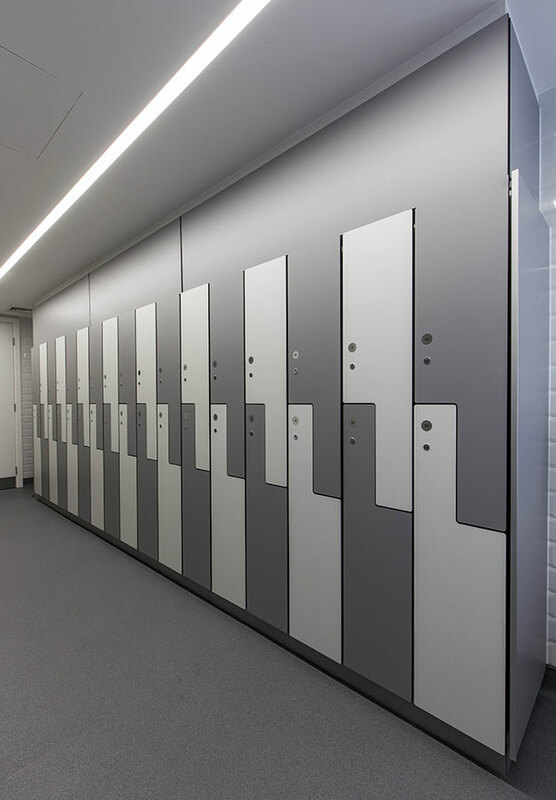 We also installed our Forza solid grade laminate lockers in a bespoke Z style alternating between the same grey and white colour scheme to match the shower cubicles. 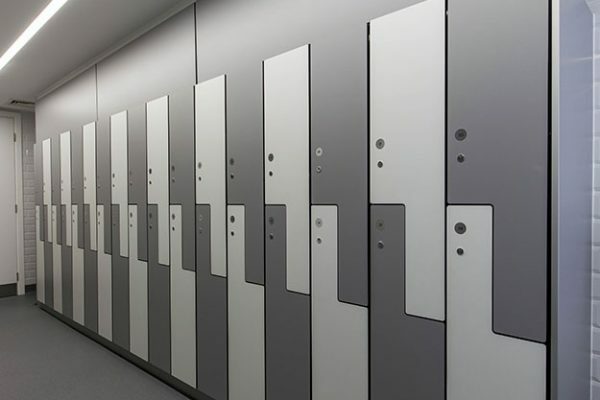 The lockers have been created with the needs of office staff firmly in mind as the bespoke Z style design can easily accommodate a suit. 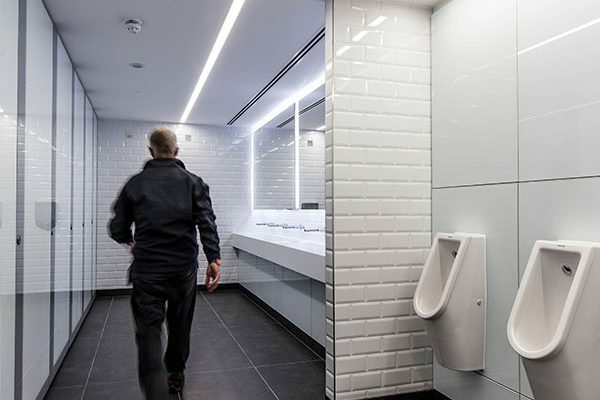 The new washrooms at 55 Bishopsgate use the same grey and white colour palette to create a sense of cohesion between different areas of the building. Our Alto Kristalla toilet cubicles which are full height for complete privacy, also feature rebated edges on both cubicles and pilasters for a unique flush façade. 6mm back-painted glass was adhered to the face to create a sleek and contemporary finish. We also installed our Concerto integrated duct panels, faced in toughened back-painted glass, behind the WCs. The same style was reflected in the disabled toilets we installed throughout the building. 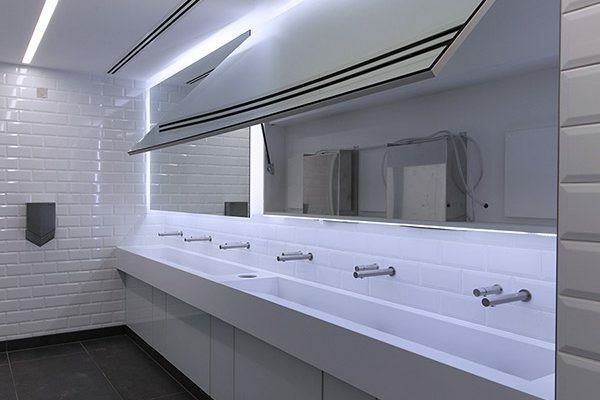 Completing the washroom design are our bespoke Corian trough style vanity units in white complete with integrated waste bin and wall-mounted taps. 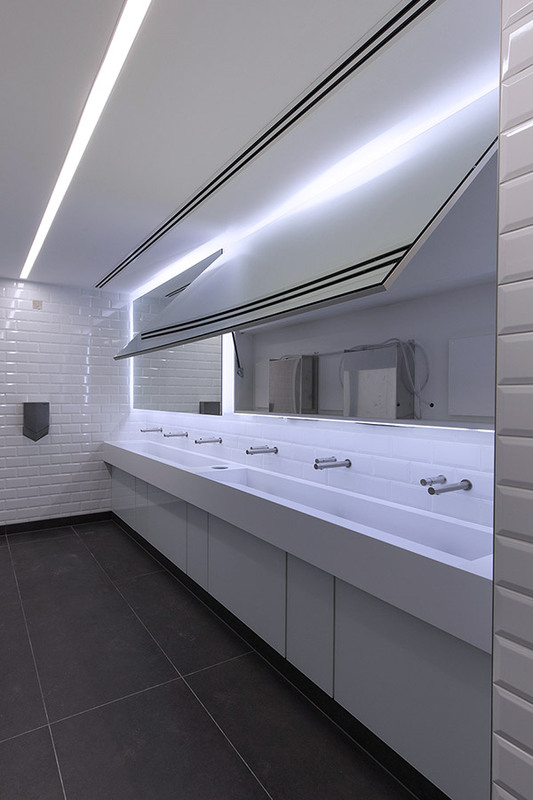 Our new Tego hinged mirror system above the vanities which included integral paper towel dispensers provides a neat and compact hidden storage solution for the essential washroom consumables – making it the perfect balance of form and function.